Last week, the U.S. Senate passed a transportation spending bill that included another record $1.94 billion in funding for Amtrak, while also attaching a number of amendments targeting Amtrak operations. These amendments come after months of controversial service and operational changes instituted by Amtrak’s new CEO, Richard Anderson. And despite Congress showing strong support for Amtrak by increasing their funding in recent spending bills, the railroad’s relationship with many on Capitol Hill is deteriorating. In the last few months, members of both the House and Senate have engaged in heated discussions with Richard Anderson himself. Their concerns are varied, but king amongst them has been Amtrak’s proposal to split up the Southwest Chief and operate a portion of the route with a bus. Many local communities have also protested Amtrak’s decision to eliminate the last remaining ticket agents at certain stations. Last week’s transportation spending bill was the Senate’s chance to push back. The “manager’s amendment” easily passed by a vote of 92-6, and included a number of amendments as part of the package (see list below). The next challenge will be to make sure these amendments are included in the final “conference” bill that will be negotiated between the House and Senate. In the mean time, TCU members should call their Senators and Congressperson to thank them for supporting Amtrak, and to demand that they include Sen. Brown’s amendment on re-staffing rural stations. 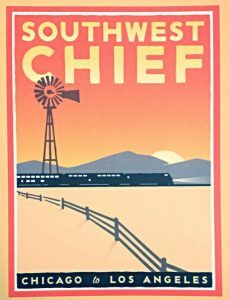 Southwest Chief – Sen. Tom Udall (D-NM) amdt. 3413 (later changed to #3665) – This amendment (full text) effectively directs $50 million of Amtrak’s funding towards investing in Amtrak’s Southwest Chief route and enabling its continued operation. The amendment also directs Amtrak to seek and receive public input through a notice and comment process whenever the company is considering service changes on the National Network. Cosponsors (5): Sens. Pat Roberts (R-KS), Michael Bennet (D-CO), Jerry Moran (R-KS), Martin Heinrich (D-NM), and Cory Gardner (R-CO). Veterans Discounts – Sen. Richard Blumenthal (D-CT) amdt. 3677 – This amendment would direct Amtrak reinstate its discount program for members of Veterans Advantage. Amtrak received a lot of scorn when they announced they were cancelling the program back in March. A previous version of this piece incorrectly stated that Senator Brown’s amendment on re-staffing rural stations with ticket agents was included in the manager’s amendment package. According to Senate staff, there was a last minute change by Senate leadership that removed a number of amendments from the final package. The two amendments above (Udall #3413 and Blumenthal #3677) are confirmed to have been included in the final bill; however, Sen. Brown’s amendment below was not.